In this page you can find information about entertainment, leisure, sport and culture. 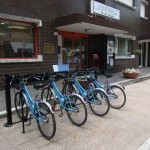 Bike sharing is a new way of getting around! It’s fun, it’s free and it allows you to discover the genuine pleasure of a nice and healthy trip by bicycle in Misano and its surrounding area. Ask for the key at the IAT office, leave a € 20,00 deposit (bring your identity card with you), pick up a bike at any conveniently located bike sharing stations and drop it off when you’re done. It’s simple, clean and affordable!